Don’t blame me, I did not come up with that phrase… it’s certainly a source for jokes around the lab, though. Here is a batch of caterpillars and eggs I’m tending to. Exciting stuff, isn’t it? (there actually isn’t any sarcasm in that phrase on my part, I thoroughly enjoy this work, but I realize it’s not for everyone!) Every day I get to clean out their frass (poop), give them new leaves, measure their head capsules, collect shed head capsules if I can, get photos of different instars, and maybe even put a few caterpillars in vials of alcohol. And of course taking notes the whole time. As much as it is important to keep digital records, I enjoy scribbling down notes and sketches on paper. It keeps my mind more organized, and I like having everything in one place I can just flip through, instead of trying to hunt down files on my computer. I was inspired by a talk given by Michael Canfield at Harvard a few weeks ago – all about the importance and history of field notes. He’s written a book called Field Notes on Science and Nature – I have not read it yet, but I intend to. So far my notebook isn’t very thrilling, but I do have a few cute caterpillar sketches in there. 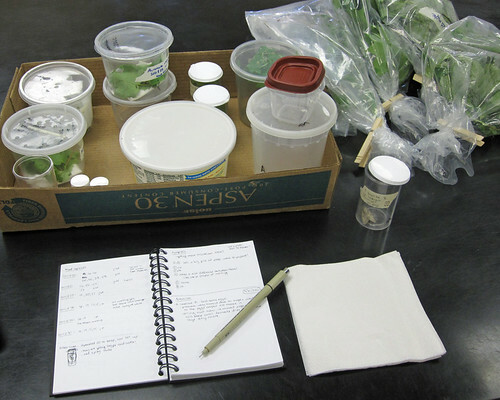 As an aside, notice the jar by itself on the desk, with the lid partway off… that’s my A. lobeliae female! She laid some eggs! Unfortunately, I had left her sugar water soaked napkin in there, which made the vial very humid. Caterpillar eggs do not like humidity, so I’m not sure if they’ll end up being viable or not. So she’s getting aired out, and kept a while longer, perhaps she’ll lay more. Posted on May 31, 2011, in Acronicta, Acronictinae, Invertebrates, Lepidoptera, Noctuidae. Bookmark the permalink. 1 Comment.